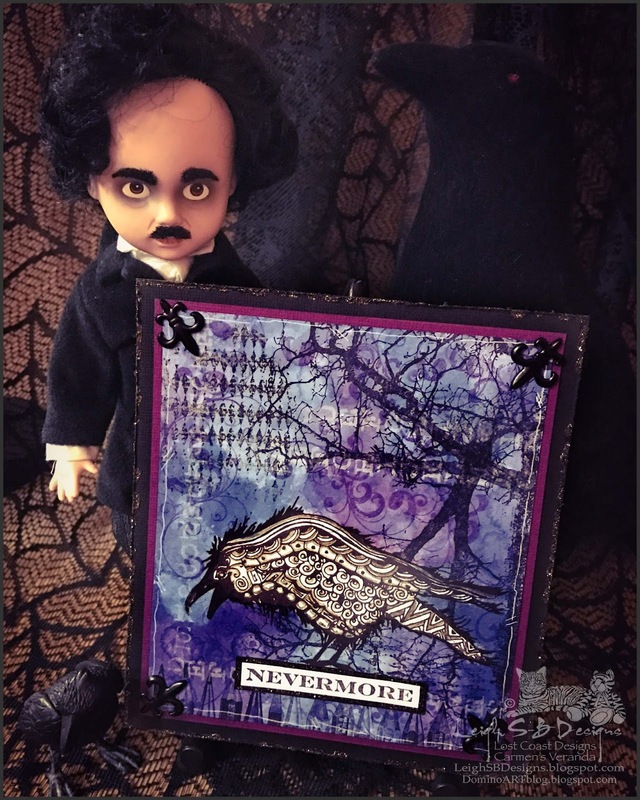 Velvet Paw Creations: "Nevermore" card - Poe Appreciation Blog Hop at Lost Coast Portal to Creativity! 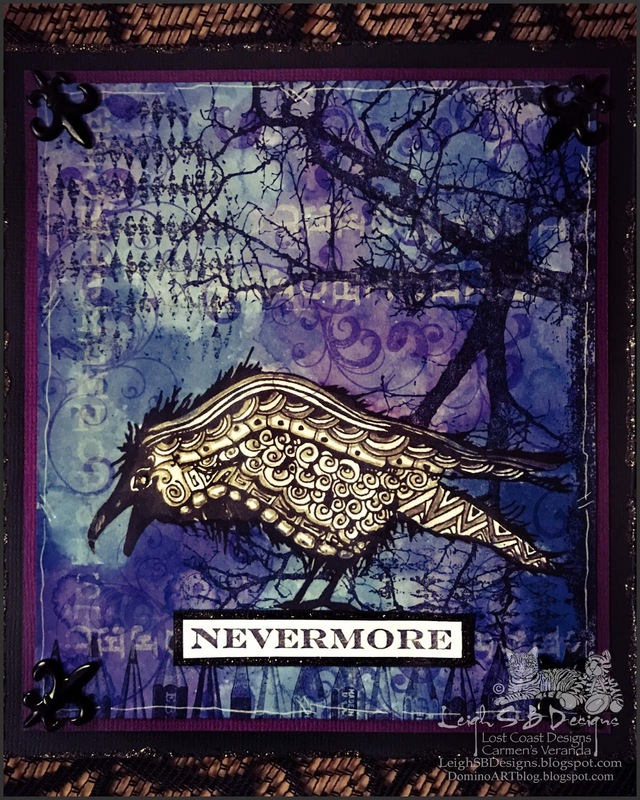 "Nevermore" card - Poe Appreciation Blog Hop at Lost Coast Portal to Creativity! Today is Day 3 of our Poe Appreciation Day Blog Hop over at Lost Coast Portal to Creativity! This is a progressive hop that spans over 5 days and new Poe projects accumulate as more Poe fans play so check daily and hop all the blogs! The Blog Roll is in the form of an Inlinkz link up and the HTML code to use in your blog posts is provided over at Lost Coast Portal to Creativity HERE! The Blog Hop Roll is at the bottom of this post! One participating Blogger will be randomly selected to win $10 in LCD/CV Bucks to spend on rubber at our Lost Coast Designs and Carmen's Veranda online stores! So hop on over to Lost Coast Portal to Creativity for all the info on how to play! In celebration of our 2nd Poe Hop we released NEW stamps and I used one of the large Ravens on my project today! Lost Coast Designs newest Zentangle inspired Raven Left Large as well as the Long Swirl Flourish, Pencil Tops Border and Verticle ABC Border, Grunge Tree background and Diamond background from the ATC Grunge Background set and the small Nevermore text...which is one of the Poe Hop Freebies you can get just by placing an order! I stamped the Raven with Black Archival ink onto watercolour cardstock and masked him with Pebeo masking fluid. I then created the gorgeous blue and purple watercolour background with Nuance Pigment Powders. I then got to work stamping all the elements to create the background: the flourishes were stamped with Grape Jelly Memento ink, the verticle alphabet with Cloud White VersaMagic ink and the pencil tops border, grunge tree and diamond pattern and the Nevermore text (on a separate piece of white cardstock) were stamped with black Archival ink. I then edged the panel in white Dylusions paint pen. I coloured the Raven with a graphite pencil in the traditional Zentangle style once I removed the masking fluid. The panel was layered onto purple/plum cardstock and I punched holes in all four corners and attached fleur de lis brads and then adhered it to a folded card made from a sheet of black cardstock. I trimmed the Nevermore text, matted it onto black cardstock and then adhered it to the card. To complete the card I applied black Studio G glitter glue to the black card edges as well as the Nevermore text. Now off you hop to see more fabulous Poe inspired creations! Enjoy! I LOVE this! Love, love, love it! Thanks for the inspiration because I never think of leaving a stamp like this as just black and white! 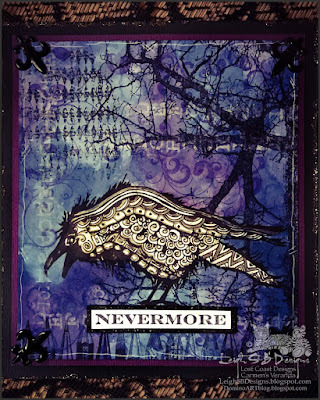 Love your card...wonderful moody background....and love the new Raven stamp and wording! Love that raven...and the background is brilliant! That raven is so awesome, and the way you presented him he is positively glowing. Wonderful. You've created an awesome background, really like the pens, for the fabulous newbie bird.